Our Cary / Raleigh Showroom features Multi-option dedicated Home Theaters, Multipurpose audio / video demos and a speaker comparison room featuring full surround sound speakers and 2-channel options. 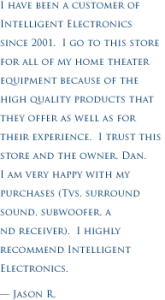 Learn some of the details about our showroom from the description below, then come by and experience them for yourself! The Audiophile Theater – Acoustically treated, a full Paradigm Persona system mated with Anthem amplification and a top of the line Sony 4K laser projector. The Open Air Theater – Engineered for moderate lighting with multi-purpose rooms in mind, this theater features Definitive Technology Super Towers with Dolby Atmos Modules and an Epson Pro Cinema 4K Projector. 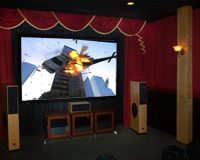 The Convertible Theater – Includes a 55″ TV for everyday use and a massive 140″ drop down, mechanized screen for the big event,250 Watts X 7, with a complete 7.1.4 THX system by Atlantic Technologies featuring Dolby Atmos. 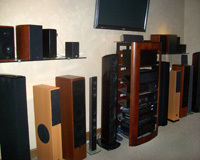 In-wall Theater – Sample four complete in-wall/ in-ceiling speaker systems with an Sony HD Projector and fixed screen. 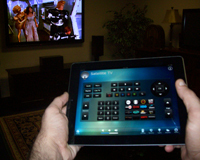 With minimal construction and hidden components, these discrete systems eliminate clutter AND much of the expense of owning your own movie room. 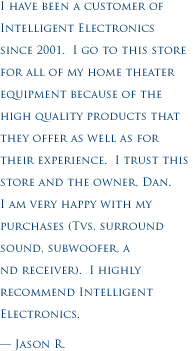 Speaker Studio – Speakers are very personal. Compare 10 different personalities in this studio in full range stereo or complemented by a sub woofer and surround sound speakers. Cash, VISA, Mastercard & Discover.